Imphal, August 31: Romi Bags Industries today launched a shoe factory, first of its kind in the North East India which targets to produce 4 lakh school shoes by March 2018. 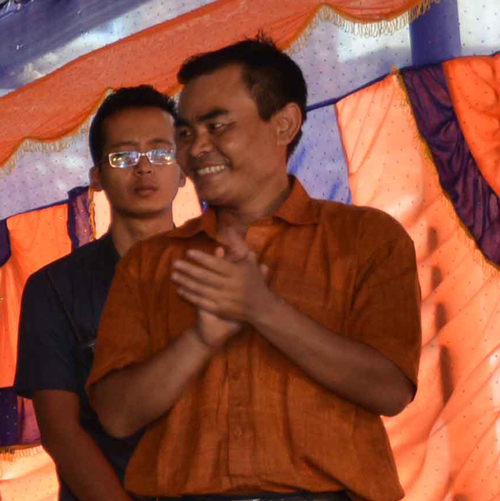 Chief Minister Nongthombam Biren inaugurated the factory in a mega event held at Kwakeithel, Imphal West. Biren Singh said the state government has already earmarked a budget of Rs. 35 crores in the state budget under the “Startup India” initiative to encourage the local entrepreneurs of the State. The central government has already started “Startup India” campaign aimed at promoting start-up ventures to boost entrepreneurship and encourage start ups with jobs creation for the unemployed youths in the country. Khumbongmayum Dhanachandra, proprietor of Romi Bags Industries talking to Pothshang, said, “My new factory can produce 4,000 pairs of shoes per day and I am targeting to produce four lakh pairs of shoes by March, next year.” “I have also plan to export the product”, added Dhananchandra. “This shoe industry is the first of its kind in the North East in terms of technology used, said Dhanachandra. I am using Kung technology of China. No shoes factories in the North East has so far use the machine which is used in the production in my factory. The machine is PVC DIP single double colour Injection Moulding Machine (automatic)”, said Dhanachandra. It can produce various types of shoes including canvas and sneekers. There are local shoes producing unit in the state which are run by self-help groups. Dhanachandra also said he is aiming high to export his products. Dhanachandra established his industry on February 25, 1996 as a small bag industry. Including a new show room inaugurated today with the inauguration of the shoe factory the industry has four show rooms, the others at Thangmeiband, Paona Bazar and Singjamei in Imphal. The industry has 45 trained employees at present. He has been supplying school bags, rain coats and school uniforms. “I have the vision to begin a new industrial revolution in the north east region and for this I have started linking with few Nagaland entrepreneurs”, said Dhanachandra. The shoe factory is using domestic raw materials by implementing Chinese ‘Kung’ technology. “The shoe will be produced in compact with no seperate sole”, said Dhanachandra. Dhananchandra got National award in 2007 for his contribution in small scale industry. The chief minister urged the unemployed youths of the state to become job creators instead of becoming job seekers and should not be craze for white collar jobs. The government would introduce policies and programmes to encourage the entrepreneurs of the State, said Biren Singh. He also urged the banks to encourage the local entrepreneurs and start-ups by providing financial assistance for their venture. Skill development programmes have been embarked by the state government to meet the aspirations of youth through training to enhance employment avenues among the unemployed youths. Proper planning and maintenance is very much needed to uplift and growth of small scale industries in the State, he added. The industry has been annually presenting awards to the schools that have produced at least 10 position holders upto the rank of 25 in the HSLC exam conducted by BSEM. Tiny Tot’s Unique School, Imphal and Nirmalabas High School, Imphal today received a cash award of Rs. 40,000 each for the 2015-16 and 2016-17 board exams, in a special function held in the mega event. Biren Singh said the new government is ready to help, encourage and promote the local entrepreneurs in every aspect. Minister for PWD, commerce and industries Th. Biswajit and minister for education Th. Radheshyam were also present in the event.